****ALERT****We want to thank all of you for helping us reach a milestone today of over 475,000 installs and growing. 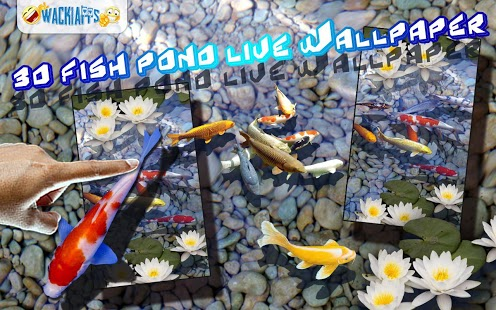 With your extremely positive feedback on our interactive version 1 we created back in May called, Live 3D Koi Fish Pond, we have decided to create our 2nd version titled: 3D Fish Pond Live Wallpaper. These pet fish will amaze you for hours. A freshwater fish pond that is simply above the rest. So many types of fish that you will never get bored of a wallpaper again. 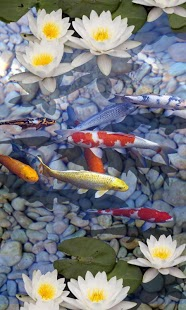 Koi Fish, Goldfish, and much much more. Call it a fish pond, fish-tank or fish aqaurium…its up to your imagination. You will simply be amazed by the awesome Live fish swimming in the fish pond 3D graphics that will save as a live motion wallpaper on your smart phone. These aquarium fish are simply amazing to look at! This highly addictive visual live background fish-tank speaks for itself. Take 2 minutes to install this and enjoy this wallpaper for hours. Keep this application on your phone for new monthly fresh water fish updates for free. Enjoy the easy user settings to change the speed, of the Fish and pond, the water. Change the frequency of the water bubbles and the bubble size as well. Please read instructions below and view in the promotional images published for accurate set up, and how to save the wallpaper options on your phone! Then when you simply press the “SET WALLPAPER” option and you are ALL SET!!! Watch real 3D Fish swim in the colorful pond right onto your phone! Watch the moving assortment of fish as they move in real motion time, for you to enjoy for hours. It does not get any more real that this! You will quite simply never use another screen save again. This is sure to amaze! You will be amazed by the super high quality variety of Fish swimming in their natural environment as they move freely on your smart phone. 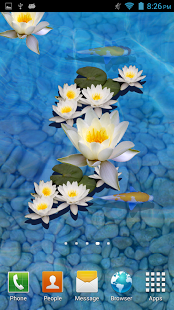 This is simply the very best quality 3D Fish Pond Live Wallpaper you will ever see. We want to keep the app completely free, In order to keep free is ad supported and may contain ads in the notification tray and or home screen. This will help keep it free and help us bring you more cool apps like this in the future. No Icons and No Annoying Push ads! You will typically be directed to a third-party’s web page. We may pass certain information to the third parties operating or hosting these pages, including your email address, phone number, and a list of other apps on your device.